Determination (Chariot) represents controlled, rapid and focused change. The decision has been made; now it is time to use drive and resolve to affect the change necessary to achieve the goal. The energy of this card is about directing transformation through rigorous self-discipline and hard work. By engaging the energy in Determination, the individual is able to overcome adversity and limitations. If the rider loses focus, or gets distracted, he knows he will not attain his aspirations. 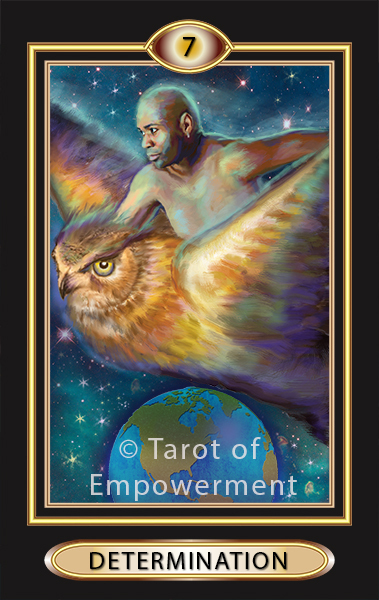 In Tarot of Empowerment Determination is depicted by a man flying on the back of the owl, the animal that represents wisdom and transformation. The ability of the owl to see in the night helps her navigate because she can distinguish true reality from that which is illusion. The rider is focused on his objectives, riding his totem owl with intelligence and intuition. Upright: When you get Determination in a reading, it suggests that you know what you must do. Now is the time to boldly approach the rapid change coming your way as a result of that decision and follow your true path. Know that the energy of the situation may change so quickly that you must intuitively adjust your flight as there will not be time to make new plans. By the very nature of setting your intention, focusing on your goal, and riding the wings of spirit, you are likely to succeed. Empowerment: You are empowered to have faith in yourself and the decisions you need to make and to travel with your personal beliefs and values as your compass. Reversed: Determination reversed may signify significant changing going on within you. As a card representing a block, the message is to slow down. Don’t rush into things until you are sure you are clear that the course of action you are considering will be in harmony with your true path. Numerology: Determination is the number 7, which is will-power and control. The other number that reduces to 7 is Chaos (16).